Are Venture Capital Firms like Ally Bridge & Boston Scientific who fund startup NxThera acting Unethically? Updated: Reportedly, when reached for comment regarding Mr. Fabian’s employment status, a NxThera operator wouldn’t comment stating it was their general policy not to say. This is a false statement in that companies can and should confirm if an employee is working there or not. Particulars should not beyond the confirmation or denial. What’s NxThera hiding? That’s certainly what the feds and taxpayers should be asking. 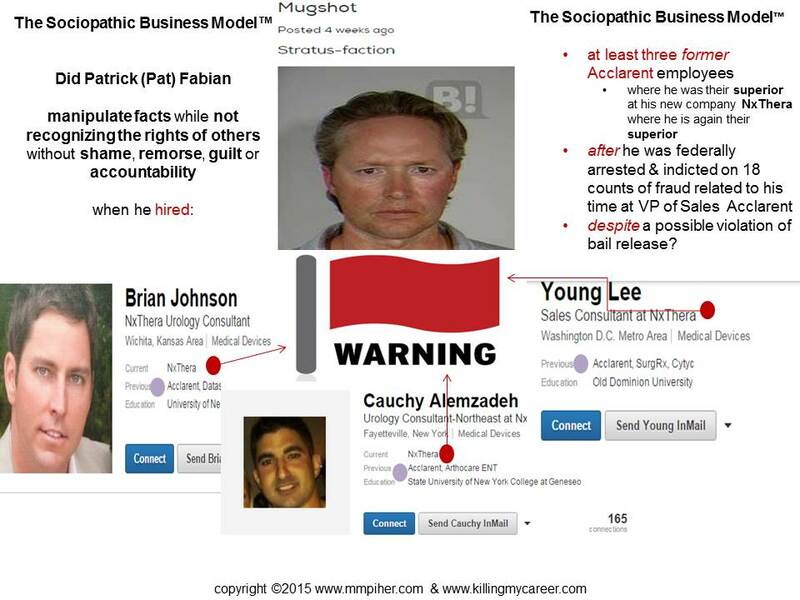 Are Venture Capital Firms like Ally Bridge & Boston Scientific, who are in part funding startup NxThera, acting unethically if they remove a federally indicted executive from the NxThera website BUT NOT the Company? 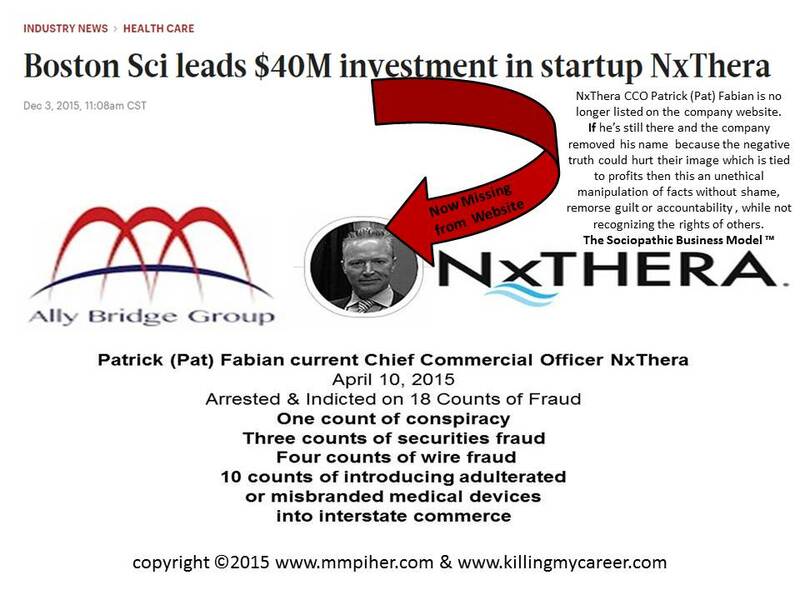 December 3, 2015, startup NxThera announced a $40M round of funding led by Boston Scientific; however, there was suddenly someone missing from the company’s website, NxThera’s federally indicted Chief Commerical Officer Patrick (Pat) Fabian. NxThera already has a history of unethical behavior under the direction of CCO Patrick Fabian, when he hired reps from his former company Acclarent, which he’s currently under federal indictment, this could and should be viewed as a conflict of interest at the very least. Updated: Reportedly, when reached for comment regarding Mr. Fabian’s employment status, a NxThera operator wouldn’t comment stating it was their general policy not to say. This is a false statement in that companies can and should confirm if an employee is working there or not. Particulars should not beyond the confirmation or denial. What’s NxThera hiding? If Fabian is still with NxThera as the company’s CCO and they removed his name because the negative truth could hurt their image which is tied to profits then the company is acting unethically by manipulating the facts without shame, remorse, guilt or accountability while not recognizing the rights of others per The Sociopathic Business Model™. If we want to prevent future startup fraud in the medical device industry then we must be willing to recognize the signs from the start. When a startup engages in unethical behavior it seldom stops at one incident but rather will escalate to dangerous and often illegal behavior potentially costing patients their lives, employees their jobs and taxpayers billions and only stopped once forced accountable either by exposing the unethical and illegal truth publically or through legal intervention with the goal of creating positive change. Removing Fabian from the NxThera site without removing him from the company is about their company image & profits but it does not remove the potential threat and why every employee, patient, and taxpayer, should demand that NxThera, with transparency, put patients before profits. Please contact NxThera and force accountability and transparency and ask if Patrick (Pat) Fabian still works for NxThera or if he was removed from the company website to protect the company’s image? Please feel free to leave your findings and comments below. One person can’t change much on their own is what unethical companies want potential or eventual victims to think. We can’t expect others to fix what we aren’t willing to do ourselves first.